Slice onions then heat a large saucepan over medium heat. Coat with cooking spray once hot and toss in onions. Add the butter and let the onions soften. You need to keep stirring and watch them carefully because you don't want them to burn. About 15 minutes into the process, add ½ cup of warm water and cover the pan, checking them in about 10 more minutes. Once the water is evaporated, keep the lid off and again watch carefully to make sure they don't burn. They should have a nice golden brown consistency. Move the caramelized onions to a cutting board and chop. Place the cream cheese and sour cream into a large bowl and whip with a hand-mixer for about 30 seconds. You want them nice and fluffy. 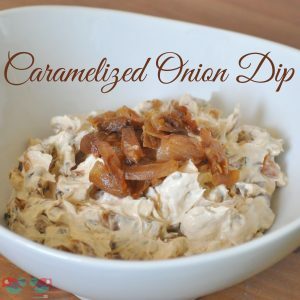 Stir in the caramelized onions (I like reserving a small amount of onions to top the dip with) and add pepper to taste. Then mix, cover, and refrigerate.